With the emergence of computers in the late 1960’s technology soon became the next big thing mankind invented. The invention of technology fueled the generation of computers, software, hardware, the internet and life as we know it today. The gambit of the word “technology” has now become further and wider than expected and can of course not be pinpointed to a set number of things. But one the vertical the development of tech has fueled is Robotics. Which is what we will be speaking of now with respect to a company names Invento Robotics. Invento Robotics actually started from a pivoting an old company. There was an educational startup with the name Ivento Markerspaces which was founded by a man called Balaji Vishwanathan. 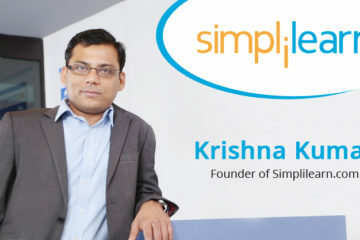 “We wanted to change education with a maker-centric approach, but it turned out to be harder than we had anticipated,” shares Balaji Vishwanathan with Economic Times. However, in 2016 the team of Invento Markerspace created a robot that garnered a lot of appreciation. Here is when the founders realized that this could be a better idea and robotics was probably the industry to pursue. Thus Invento Robotics took shape in October of 2016. Vishwanathan is the co-founder and possibly the face that is associated with Invento Robotics on all platforms. The man has a has described himself as a ‘writer, wanderer, coder, marketer, product manager and a crazy driver’. He is also a man who was the most followed person on Quora as of 2017. Thus, with an interesting repertoire, Vishwanathan embarked on pivoting his company from the education industry to the massive world of robotics. But what are the kind of robots that Invento actually makes? In one word- humanoid. Humanoid robots. A humanoid robot is a robot with its body shape built to resemble the human body. The design may be for functional purposes, such as interacting with human tools and environments, for experimental purposes, for locomotion, or for multiple studies. But along with attributing the physical aspects of a human to a robot, Invento also wants to attribute the emotional ones. With the ability to move around on its own, recognise people from their faces and the ability to converse with them, you can build a range of new interfaces on top of the Mitra. 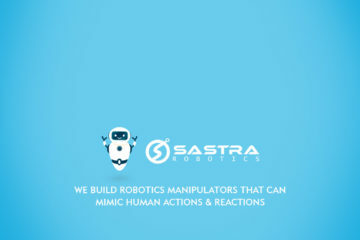 The most prominent interactions of Invento are by its flagship robot called Mitra. With Mitra’s AI capabilities you can understand more about your customers and engage them better leading to better sales and customer satisfaction. Unlike humans the robots maintain context across your different locations and provide a patient service. At a time when humans become like robots, we bring back humanity through robots. Face Recognition: the Mitra can identify people using visitors, identify their age, gender, dominant emotion levels, and all of this is done through computer vision. Conversational Abilities: the Mitra can engage people by recognising speech input from a person and also talk back to the person using the power of natural language processing within its computer software. Autonomous Navigation: The Mitra robot has an added level of being “human” with its ability to navigate anywhere on its own. It can move around in an autonomous manner and has movement and precision levels down to the centimetre. But who uses Mitra and is it a successful venture by Invento? The simple answer is yes. Invento’s humanoid robots are found everywhere from corporate get together, birthday’s, customer care centres, workshops, and entertainment events. 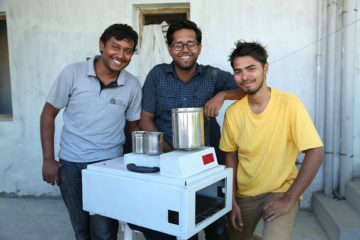 While the current presence of these robots is on a limited level, only at niche events and places, the founders want to make Mitra more omnipresent. They want to integrate the robots not just as accessories but as real working contributors such as butlers, receptionists, doormen, or even salesmen. Any job that can be found excruciating or mundane for humans. We (Invento) are often replacing vacuum. Robots bring no more layoffs than washing machines do. Robots can do jobs that we are not doing now: taking care of elders—the alternative is loneliness, pain and hardships. Playing with children on the ground—the present alternative is TV. Doing security—present alternative is crimes. Doing customer service—present alternative is confusion. The proof for Invento and the strength of its concept is also in how it is now being showcased everywhere. The biggest showcase of the robot Mitra was at a public interaction session with Ivanka Trump and Narendra Modi at the Global Entrepreneurship Summit being held in Hyderabad. 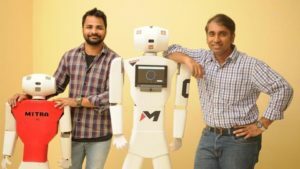 The humanoid robot Mitra is also found at various real-life locations such as the offices of Canara Bank and the PVR cinema halls in Bangalore which can greet consumers, give directions, or contextual support. “What Google does for the online world, we do for the offline world. The robot speaks to the customers, gets to know them and their preferences, and on subsequent visits makes contextual suggestions. Mitra can help businesses do better customer targeting. For instance, in supermarkets, Mitra is capable of collecting relevant data on your first visit and not only make suggestions on your corresponding visits, but also take you to that particular aisle,” explains Vishwanathan. So far Invento has raised only one single round of funding. 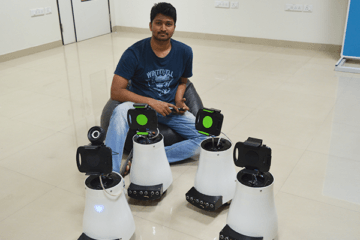 Invento Robotics has raised a total of ₹13.5M in funding over 1 round. This was a Pre-Seed round raised on Mar 4, 2019. 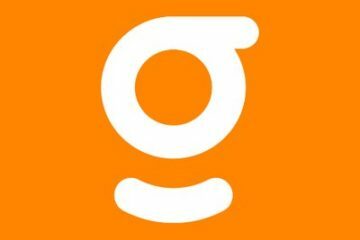 The name of the investor(s) is undisclosed currently on Crunchbase. An in depth look into the founding of Mukunda Foods.